Once the base of a notorious bandit leader known as “The Stag Lord”, Fort Stag dominates the new city of Horcroft. It is set on a low conical hill on the shores of The Tusk Water and its tall buildings can be seen from right across the city. To get to the tower you follow a road up the side of the hill to the outer wall where you are met by the guards. The outer wall is stone and pierced by seven great towers that house both the Horcroft regiment and the Newhaven Horse. You are then escorted across the outer courtyard to the inner walls, which are higher and build of good solid stone. The Inner gate is guarded by two stone towers. 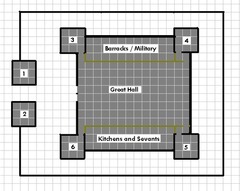 The Main building consists of a single great hall with a high peaked roof, lower wing-like extensions on each side. Currently one side is used as kitchens and staff accommodation while the other is used as a barracks. There is another stone tower in each corner. Each tower has a chamber on the ground floor that serves as an office for its occupant, the upper floor has a similar room that serves as their living accommodation. The very top floor built of wood with hoardings and a light roof. In times of conflict they serve as a firing platform for bowmen and mages - during peace time they either serve as a watch point or as an extra room for the occupant. The towers are currently allocated as follows.